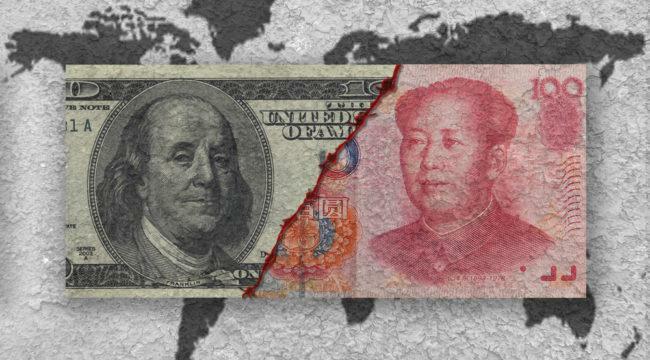 Rickards Warns "Prepare For A Chinese Maxi-Devaluation"
Currency wars arise in a condition of too much debt and too little growth. Economic powers try to steal growth from their trading partners by devaluing their currencies to promote exports and import inflation. But China can’t keep going with tariffs. For China to keep fighting, they need an asymmetric response; they need to fight the trade war with something other than tariffs. China holds over $1.2 trillion of U.S. Treasury securities. Some analysts say China can dump those Treasuries on world markets and drive up U.S. interest rates. This will also drive up mortgage rates, damage the U.S. housing market, and possibly drive the U.S. economy into a recession. Analysts call this China’s “nuclear option” when it comes to fighting a financial war with Trump. The nuclear option is a dud. If China did sell some of their Treasuries, they would hurt themselves because any increase in interest rates would reduce the market value of what they have left. Also, there are plenty of buyers around if China became a seller. Those Treasuries would be bought up by U.S. banks, or even the Fed itself. If China pursued an extreme version of this Treasury dumping, the U.S. President could stop it with a single phone call to the Treasury. That’s because the U.S. controls the digital ledger that records ownership of all Treasury securities. We could simply freeze the Chinese bond accounts in place and that would be the end of that. So, don’t worry when you hear about China dumping U.S. Treasuries. China is stuck with them. It has no nuclear option in the Treasury market. I just argued that China’s “nuclear option” in the trade wars is a dud. But, that does not mean China is out of bullets in a financial war. China cannot impose as many tariffs as Trump because they don’t buy as much from us as we buy from them. China cannot dump Treasuries because there are plenty of buyers and the president could stop the dumping by freezing China’s accounts if things got out of hand in the Treasury market. But China could use a real nuclear option to counteract the trade war by fighting a currency war. If Trump imposes 25% tariffs on Chinese goods, China could simply devalue their currency by 25%. That would make Chinese goods cheaper for U.S. buyers by the same amount as the tariff. The net effect on price would be unchanged and Americans could keep buying Chinese goods at the same price in dollars. The impact of such a massive devaluation would not be limited to the trade war. A cheaper yuan exports deflation from China to the U.S. and makes it harder for the Fed to meet its inflation target. Also, the last two times China tried to devalue its currency, August 2015 and December 2015, U.S. stock markets crashed by over 11% in a matter of a few weeks. So, if the trade war escalates as I expect, don’t worry about China dumping Treasuries or imposing tariffs. Watch the currency. That’s where China will strike back. When they do, U.S. stock markets will be the first victims. Maybe you think that’s unlikely because it would be such an extreme reaction by China. But you have to put yourself in the shoes of China’s leadership. These aren’t academic issues to China’s leaders. They go to the heart of the government’s very legitimacy. China’s economy is not just about providing jobs, goods and services. It is about regime survival for a Chinese Communist Party that faces an existential crisis if it fails to deliver. The overriding imperative of the Chinese leadership is to avoid societal unrest. If China encounters a financial crisis, Xi could quickly lose what the Chinese call, “The Mandate of Heaven.” That’s a term that describes the intangible goodwill and popular support needed by emperors to rule China for the past 3,000 years. If The Mandate of Heaven is lost, a ruler can fall quickly. Essentially, China is on the horns of a dilemma with no good way out. On the one hand, China has driven growth for the past eight years with excessive credit, wasted infrastructure investment and Ponzi schemes. The two ways to get rid of debt are deflation (which results in write-offs, bankruptcies and unemployment) or inflation (which results in theft of purchasing power, similar to a tax increase). China’s internal contradictions are catching up with it. China has to confront an insolvent banking system, a real estate bubble, and a $1 trillion wealth management product Ponzi scheme that is starting to fall apart. A maxi-devaluation of their currency is probably the best way to avoid the social unrest that terrifies China. China doesn’t have a trade war nuclear option. But it does have one very powerful weapon. And it looks like it could be getting ready to use it.